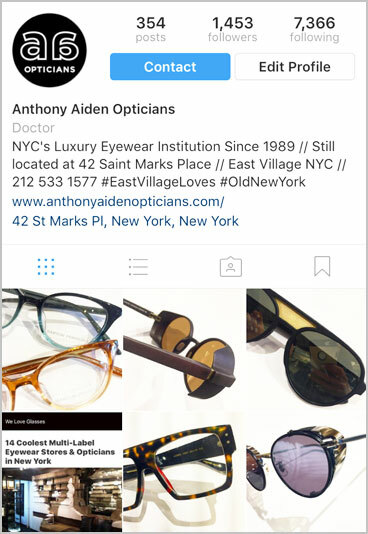 THE CHALLENGE: Creating a new identity for the rebranding of the 25-year-old "Myoptics" luxury eyewear boutique, to the newly named Anthony Aiden Opticians, proposed a few challenges. 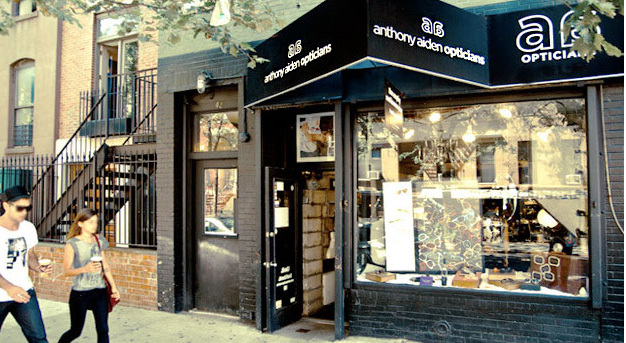 THE CONCEPT: Not wanting to seem like another new addition to the already over-gentrified neighborhood, the logo was designed not only to convey the shop's main focal point (the double A's subtly created two eyes) but to also have a classic, iconic look that embodied "Old New York". 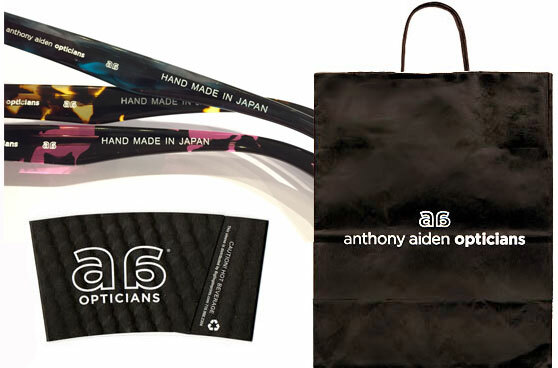 Anthony Aiden eyewear, bags and coffee cups sleeves. THE STRATEGY: To gain super-recognition for the new logo, every visitor walked out with either a bag, a business-card, or an embossed leather case. Even double "A" coffee sleeves were dispensed at the neighboring coffee shop. Lens-clothes were patterned with it, stickers were stuck to packages with it. Right down to the tiniest temple pieces of their signature eyewear. All was engraved with the new logo. "Same gang. Different sign." Sign. The second challenge was how to express that the new brand did not mean new ownership. In an attempt to not thwart off loyal customers, a simple sign with four words: "Same gang. Different sign" was created. This let people know at a glance it was still same downtown institution that they've loved since 1989. Web ad for Anthony Aiden. Click to view. COMMERCIAL DESIGN: Created this stylish yet raw and funny commercial as an additional marketing tool. By launching it on fashion blogs, social media and Youtube, it drew traffic and new interest. A clean "teaser" version of the film displayed on a loop in the shop's storefront window prompting viewers to see the full "too-hot" version on their site, this helped catch additional traffic to the Web site. ADVERTISING: Responsible for all print and online advertising. Full-page and quarter-page ads are regularly placed in Time Out New York and other publications. SOCIAL MEDIA: Also responsible for all social media accounts. Photos of actual "in-stock" eyewear as well as other current events are regularly produced giving the brand even more traction. This brings more viewers to the Web site as well. THE CHALLENGE: Visibility for a brand new shop. 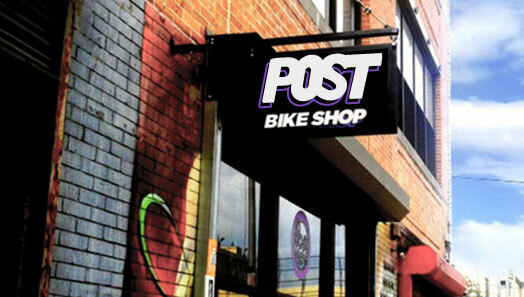 BMX-inspired specialty store needed to get noticed. Wanting to gain recognition as a BMX-street-culture specialty store as well as a sales and repair shop, the look needed to attract both the BMX youth-culture as well as the local demographic of Williamsburg cyclists. THE STRATEGY: To gain attraction from the bustling Bedford avenue, this super clean, bold logo proves easily visible from the main corner. Bigger plans needed a branding mark that would transcend into a clothing/apparel line. Created sticker packs to label their line of signature bike-frames. 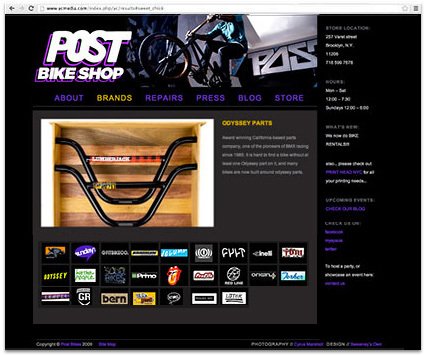 A collaboration with bike-builder Seth Rosko. The decals gave the bikes a throw-back look and is a nod to the classic bike decal. 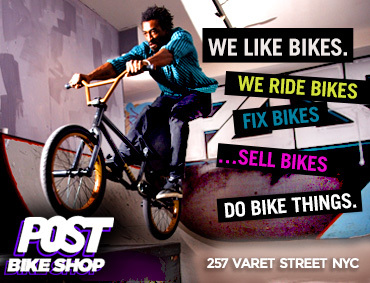 COMMERCIAL DESIGN: Ongoing identity development continued with creating ads such as this one, which featured on TheComeUp.com - a major online bmx forum. Responsible for all verbiage and tag-lines used in an around the store, and on all marketing materials.